The “Baby Bug” seems to be in the air more than ever. If it’s not your sister, then it’s your best friend, or your cousin, or the girl you went to high school with, or your co-worker – whoever it may be, you’re bound to know someone who has caught this so-called “Baby Bug” and is expecting a little one of their own. What an exciting and beautiful time in someone’s life; the miracles of pregnancy, adoption, fostering, and welcoming a new little human into the world is both sensational and magical. I’m guessing you might be wondering how this could pertain to cookies? Well, I’d be more than happy to fill you in! When it comes to giving a gift to an expectant mom and dad or to a brand new mom and dad, look no further than the Fresh Beginnings line of yummy treats and personalized tins! Now on the Fresh Beginnings website is a drop down tab with the option to explore all that is new and delicious in the “Baby Gifts & Favors”. Shopping through these mouth-watering options, filled with blues and pinks, and satisfyingly yummy treats, you’re sure to find the perfect gift to give your favorite parent-to-be! Consider the cravings that come along with pregnancy and spoil your lucky friend or relative with the yumminess that is Fresh Beginnings cookies and treats. Trust me on this one! Having a sister that is currently expecting has taught me that sugar becomes a constant must-have during pregnancy in order to keep the mama-to-be happy. And a happy mama, is a happy baby. Check out the numerous options of goodie tins, treat bags, and more that can be personalized with beautiful photos and sweet messages! They truly make the perfect gift or favor for baby showers, birth announcements, or just to show that expecting-mother in your life that she is loved. 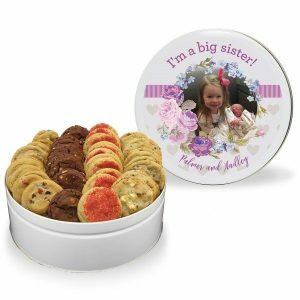 My personal favorite would have to be the Baby Gourmet Cookie Tin – 4 Flavors that is accompanied with a beautiful baby-themed design on the lid and your choice of 4 flavors of gourmet cookies. Maybe you’re not just the gift-giver in this expecting-mother’s life, maybe you’re also the hostess when it comes to all things BABY SHOWER. Don’t fret, you’ve come to the right place. Throwing the perfect baby shower takes more than just a few party games and lots of pink or blue. Food is a necessity, but everyone knows that dessert is the best part. Serve your guests what they really want, a Gourmet Cookie & Chocolate Tray, and it’s sure to be the hit of the party. Leftovers? What are those? Another huge hit when it comes to Fresh Beginnings + Baby Showers is party favors with the color-theme, or baby’s own name personalized to them. 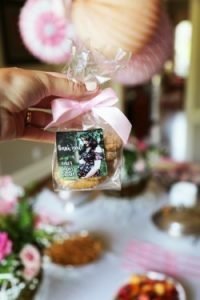 Using the Baby Gourmet Cookie Gift Bags as party favors is a great way to personalize each favor with a photo and message, as well as sending each guest home with an adorable and delicious treat! I love the idea of using little treats as both a “thank you” and a snack to send home with your guests. You’re sure to be the best host there is with party favors and snacks that keep your guests wanting more! 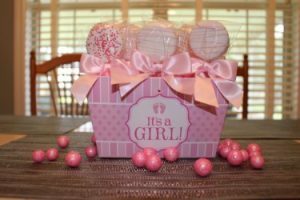 The expectant-mother in your life will probably name her future child after you once she tastes the BEST COOKIE EVER and sees how thrilled her friends and family are as guests at her shower. Don’t let your Baby Shower hosting duties slip through the cracks, order your personalized party favors and treats now! Check out the fun Baby Shower favors above for some adorable inspiration!